Some of you are going to love this review. Some of you are going to hate it. Just like some of us probably loved Bones tonight and some of us probably hated it. I'll give you two guesses which camp I'm in. The best thing about "The Maiden in the Mushrooms" was Hodgins and the hot sauce. Brennan is a ridiculously intelligent woman. She's also a mother. Apparently when her mothering kicks in all of her intelligence flies out the window. Christine bit another child at daycare. Every single person Brennan came into contact with told her that this was a normal, "average" behavior for a child Christine's age. Every single one of them. Brennan could not accept that her daughter, a toddler, exhibited such "average" behavior. That she would stoop so low as to bite another child. That the daycare would accuse her of biting when there was no proof that she was, in fact, the biter! She was so disbelieving and out to prove her daughter's innocence that she had Angela hack into the daycare's file on the bitten child so that she could gain access to pictures of the bite mark to compare them to the mold she made of Christine's teeth. A mold made specifically for this purpose. This toddler biting story grew more and more incredulous as the hour went on and mothers everywhere, myself included, groaned at the absurdity of this waste of a story. 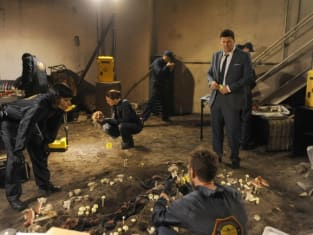 Now, had Booth been the one to disbelieve that his sweet daughter could bite another child while Brennan, who has logic and rational thinking and anthropological studies about toddler behavior on her side, reminded him that it was normal and Christine was asserting her dominance over the other children and lauded the behavior, the story would've worked. Mention was finally made regarding Angela and Hodgins' financial status. They're living off of their salaries like normal folk do. But Hodgins is in the market for a new business venture so that he can try and recoup the Cantilever Group's fortunes. Specifically, Finn's late granny's special blend. After using the last of Finn's sauce, despite the post-it note clearly marking it as belonging to Finn, Hodgins decided that he was going to recreate this special blend of spices, first so that he could give Finn his sauce back and secondly so that he they could market it and make some money. I like Hodgins' entrepreneurial spirit! I loved Finn's reaction when he realized that Hodgins had resurrected his grandmother in a way and his impassioned plea to the restaurateur to try the sauce. This B-plot saved tonight's episode, in my opinion. Opie and Thurston's Special Sauce, indeed! 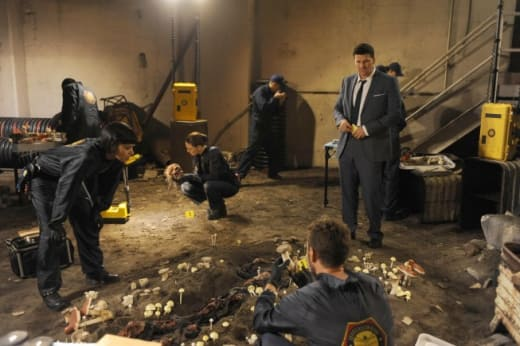 Not even the case of the week was incredibly interesting as it's become quite predictable that if there's a murder victim and the murder victim had a love interest, the love interest probably did it. I'll admit to getting a little choked up when the boyfriend talked about finding his dog, but I found tonight's mystery largely uninteresting. What did you think of "The Maiden in the Mushrooms?" Did you find Brennan overly ridiculous tonight? Or was she right to champion her daughter?